Anti-Wrinkle Treatments are a proven method by which we can achieve smoothing of the facial muscles. Please read below for more information. They have been used for over 20 years successfully in the UK and the US. Please note that this page informs you of how Botox works and that prior to administration a consultation would be required with the clinician to determine suitability. We will discuss treatment options that will encompass the problems and specific areas of concern that you may have. Botox may not be the most appropriate treatment for the concerns that you may have and this will be discussed in depth at the consultation stage. Botox is the trade name by which Botulinum Toxin A is widely known. It has been used for a variety of medical conditions including blepharospasm and muscle spasticity for over 20 years. By using the treatment in the facial muscles, e.g. 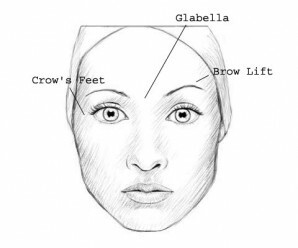 glabella, wrinkles are prevented, as they are a direct results of contracting forehead, eye and mouth muscles. Do nothing differently, just go about your normal activities as you would normally. Botox Treatment can be used for treating wrinkles in men and women, however men often need slightly higher doses than women. This anti-ageing treatment, commonly known as Botox (BOtulinum TOXin), is often prescribed by doctors to eliminate wrinkles in the upper third of the face. This includes forehead lines, frown lines between the eyebrows and crows’ feet around the eyes. Very fine needles are used so there is very little discomfort and you can resume most of your usual activities immediately after treatment. Thousands of these treatments are performed every year – noticeable from 2-14 days afterwards and lasting several months. To complement the lasting results of the treatment, we recommend the use of SPF30 sun protection cream, available at all pharmacists. Over time, with regular botox treatments, the muscles will get thinner and weaken, which means they are less able to create the wrinkles in the first place. This side effect is particularly useful for treating overactive muscles that have become too bulky over time such as in the jaw area. It is also why botox is used in the medical profession to treat muscle spasticities and over-active trigger points such as in chronic muscular pain and headaches & migraines. In rare cases, the botox can migrate to nearby muscles, causing some weakness, such as drooping of the upper eyelid. This is a temporary side effect, lasting for a few weeks at most.